Death is never a happy situation, especially when the death is caused by the negligence of another party. This type of death is known as a wrongful death. In the event of a wrongful death, lawsuits are typically used to find compensation for any dependent’s or beneficiary’s loss, bills and suffering as well as a way to find closure for the event. If a loved one of yours has died at the hands of another party, please contact us to find out if you can receive compensation for the wrongful death. At Joseph C. Crudo, PLC, our team of lawyers in San Diego takes wrongful deaths seriously to find you the compensation you deserve. Wrongful deaths can occur in common situations unusual situations, regardless, the death is due to the fault or negligence of another party. These deaths can be at the fault of hospitals, manufacturers, and even doctors. The following are examples of common wrongful death lawsuits. Healthcare malpractice is one of the most common types of wrongful deaths. This can be from a doctor simply administering a patient the wrong medicine and accidently taking their life. Other cases involve negligence while in the emergency room, misdiagnosing conditions, discharging a patient prematurely, and anesthetic malpractice. Dentists, surgeons, nurses and all healthcare providers can all be held liable for medical malpractice. This also includes any caregiver or nursing home neglect. In the event of a car accident and the car manufacturer is at fault, you can hold the car manufacturer liable. Or if commercial vehicle drivers are not following regulations that cause the accident. Other car accidents, boating accidents, or any other tragic and fatal accidents involving vehicles and negligent drivers can be eligible for wrongful death lawsuits. Workers who work in dangerous environments can end their life due to faulty equipment, simply slipping and falling, chemical exposure, and even unsafe working conditions. Products can contain defects in design, manufacturing, or failure to place warning labels when they should. 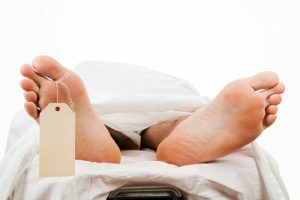 When filing a lawsuit for wrongful death, you are filing in the hopes that you will receive some sort of compensation from the party being held accountable for the death. The compensation can include money to go towards loss of income of the deceased, medical and funeral costs, as well as pain and suffering from the death. Although there is no amount of money that can replace the loss of your loved one, the money you can obtain will make adjusting to life without your loved one a little easier in regards to finances. If you have recently suffered a loss in your family and you believe it to be a wrongful death, please contact our lawyers in San Diego at Joseph C. Crudo, PLC to speak with qualified lawyers who can help. Contact us by calling 858-622-7280 for a free consultation or fill out our online contact form on our contact us page.